Pandora had some good news to share with its investors yesterday (July 31): its like-for-like total revenues grew 12% in the second quarter of 2018, up to $384.8m. That was mainly because like-for-like* quarterly subscription revenue leapt 67% to $113.7m, as the company added 351,000 paying subs across its cheaper Pandora Plus product and its $9.99-per-month Pandora Premium product. 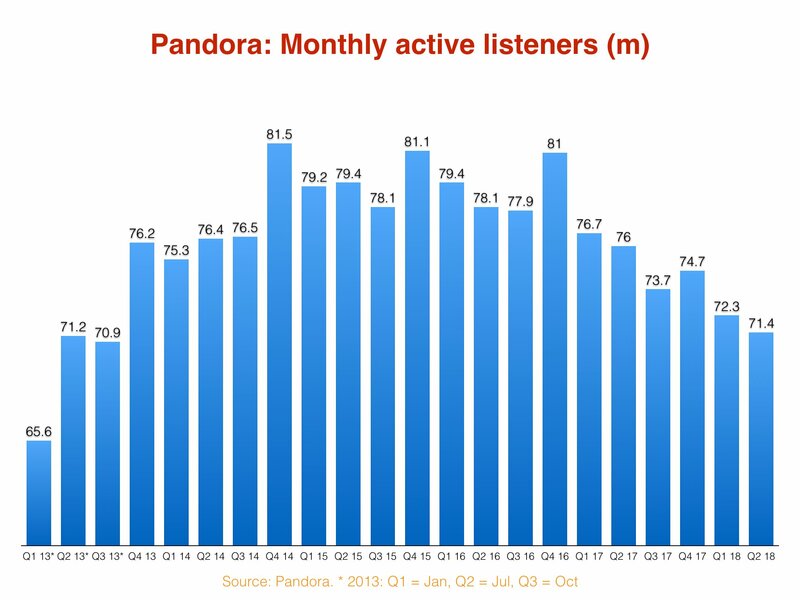 In fact, total subscribers on the service surpassed 6m at the close of June, Pandora confirmed, up 23% year-on-year. And yet during a call with shareholders after these results were announced, Pandora CEO Roger Lynch (pictured) was very clear about where the company sees the majority of its future growth coming from: ad-supported users. “There’s more ad revenue in audio than there is subscription revenue,” he stated, adding: “[If] a consumer has a propensity to pay for a subscription service, that’s great – we’ve got two tiers of subscription. 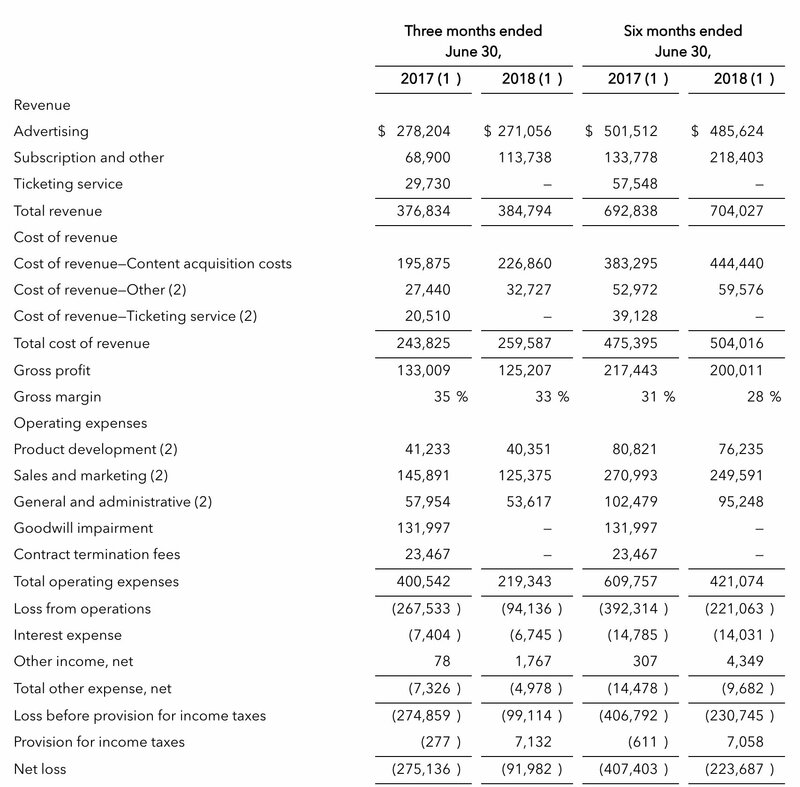 According to the small print in Pandora’s latest results, the company ended June 2018 with 71.4m active users. That was down 4.6m on the same period last year, and down 900,000 quarter-on-quarter. It was also the lowest base of consumers Pandora has seen for five years, since back in mid-2013. 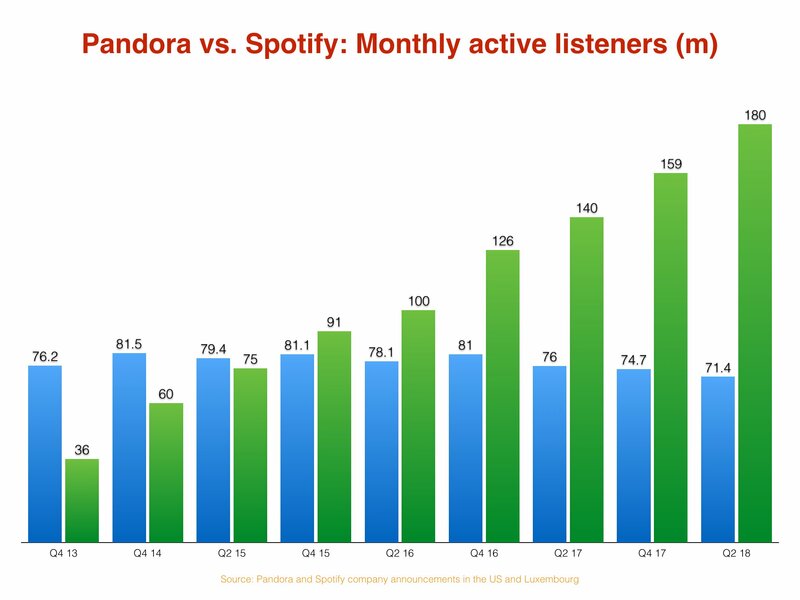 The most painful stat for Pandora investors, however, is surely this one: at the close of June 2015, Pandora had more active users worldwide than Spotify (79.4m vs. 75m). Today, just three years on, Spotify has over two-and-a-half times as many users (180m vs. 71.4m – a 109m difference). Even though Pandora has now surpassed 6m paying subscribers (with an ARPU of $6.52 a month), it’s behind on where its founder and former CEO said it would be. Tim Westergren, who left Pandora 13 months ago and was succeeded by Roger Lynch, told shareholders in February 2017 that the platform was projecting 6m to 9m paying subs by the close of last year. As for Roger Lynch’s comment yesterday that Pandora wants to be “the leader in the ad-supported side [of streaming]”, his firm clearly has a lot of work to do. In Q2, Pandora’s ad-supported revenues fell year-on-year by 2.6%, down to $271.1m. And in the first half of 2018, that number fell by 3.2% to $485.6m. Worth noting that, in May, Pandora acquired digital audio tech platform Adswizz for a total consideration of $145m; yesterday, the company also announced the launch of its first ever programmatic audio marketplace, allowing advertisers to reach what it calls the ‘largest set of ad-supported listeners in the US’. According to Lynch, Pandora plans to drive future growth in ad-supported listening via marketing efforts. He cited the fact that, in Q2, ad hour trends improved for the third straight quarter. 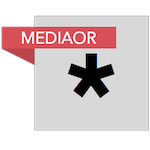 “Although we are still evolving our marketing efforts, in Q2 we were successful in accelerating subscriber growth and increasing engagement with our ad-supported product as evidenced by the improvement in ad hour trends,” he said. 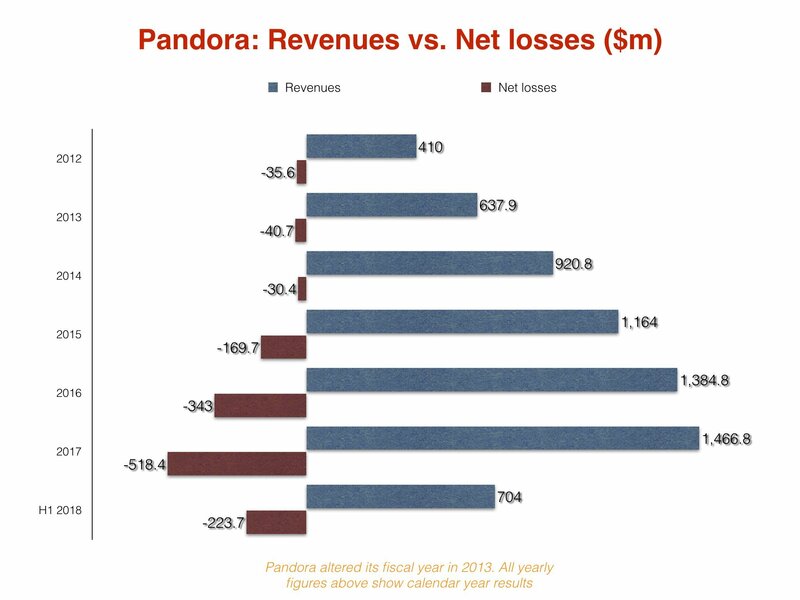 In terms of Pandora’s straight financial performance, the company saw some positive trends in terms of its losses in Q2. Is quarterly operating loss shrunk by 64.8% compared to Q2 2017, at $94.1m versus $267.5m in the prior year period. In the first half of 2018, operating losses hit $221.1, narrowing 43.6% on the $392.3m op loss posted in H1 2017. Net losses in the first half of this year came in at $223.7m, not far off half the figure that Pandora posted in the first half of last year ($407.4m). And overall six month revenues – taking into account subs, ads and other income – stood at $704m in H1 2018. Year on year, that was up by 1.6% on the same period in 2017.